Ingredients: Sauce Sachet (B): Soya Sauce (Soyabean, Wheat Flour, Water, Salt), Rice wine, Crystal Sugar, Water, Dried Chilli (5.09%), Tomato Sauce (Water, Sugar, Salt, Vinegar), Vinegar, Olive Oil, Garlic, Sesame Oil, Shallot, Ginger, Sichuan pepper. Flavour Sachet: Soya Sauce (Soyabean, Wheat Flour, Water, Salt) (A), Dried Chilli (0.64%) (C), Sichuan Pepper Powder (0.64%) (D). 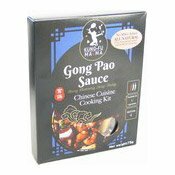 Simply enter your details below and we will send you an e-mail when “Gong Pao Sauce Kit (功夫媽媽官保醬)” is back in stock!